Stainless Steel Muffler for Classic Type 1 Engine with Twin Tail Tips, fits on Beetle 1961 up and Karmann Ghia. 1. For Type 1 Engine upto 90 BHP. 2. For Type 1 Fresh Air 1200c.c. Engine , Type 1 1300c.c ~ 1800c.c. Engine with Twin Tips. 3. ±4mm Adjustable flanges for stroker or narrower engines. 4. 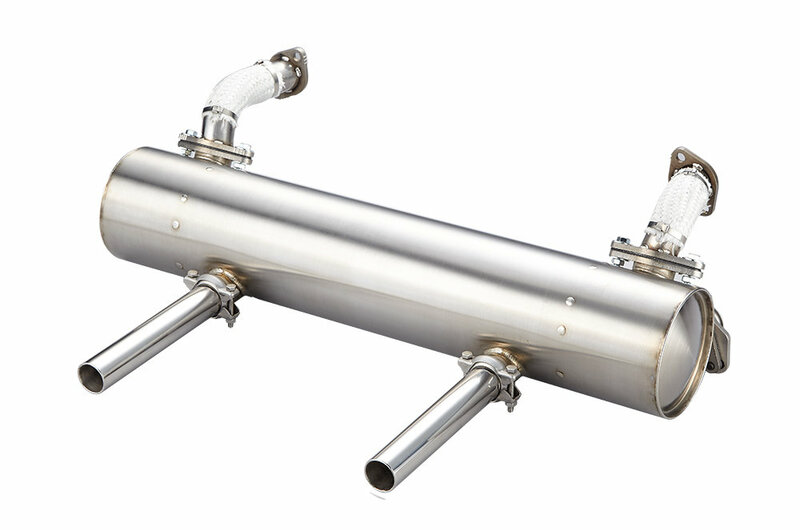 100% #304 stainless steel muffler. 6. The muffler set including: New Design of Muffler, twin tail pipes with clamps, headers for #2 and #4 cylinder, flanges and clamps connecting to heater box and gasket set. 7. This is Special Calculated and Designed for performance and ground clearance. The lowest of muffler body is sit higher than the engine case itself, this makes very well with ultra low VWs. 8. The muffler might slightly touch the crankshaft pulley tin or rear apron body work, very depending on each application. For a very straight engine compartment, the muffler will fit in without any problem. If the engine compartment had some body works done before then it might contact the body panel. Please work on the body panel a bit and DO NOT cut or hammer the muffler. Shipping cost by Air(4~8 days) is 98 USD worldwide.